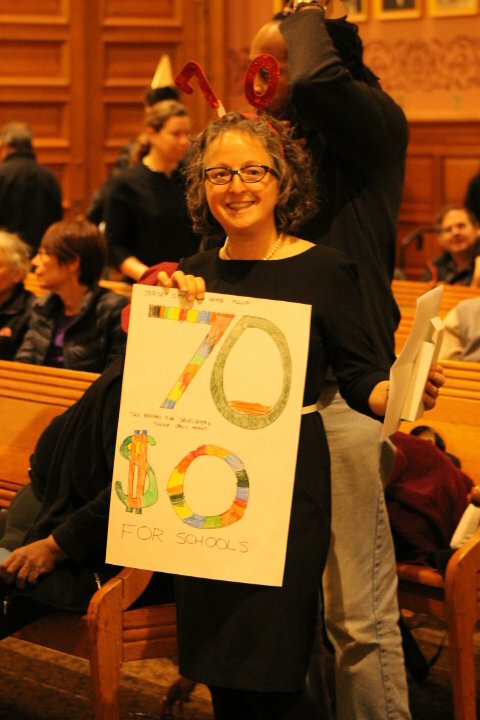 A MOVE TO SUPPORT SCHOOLS – Protestors came to the City Council meeting asking for a share of abatement payments for the schools. 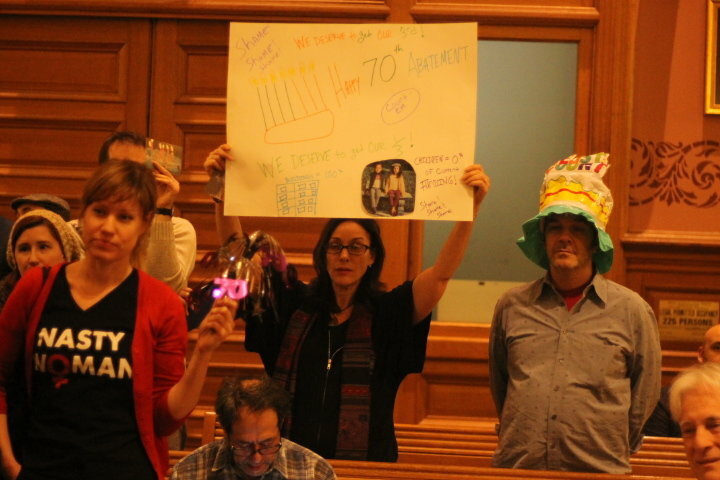 Wearing birthday party hats and bearing sarcastic signs to protest the city’s approval of its 70th tax abatement since Mayor Steven Fulop was sworn in three years ago, demonstrators appeared before the City Council on March 7, asking the city to redirect the revenue from abated properties to benefit local schools. Abatements are agreements for developments to give payments to the city each year instead of paying regular taxes to the city, schools, and county. They used to be an incentive for developers to head into less desirable areas, but are now controversial as they’re used in more popular neighborhoods. Despite the protest, by a 7 to 2 vote the council approved a 20-year tax abatement for a 63 unit development near Bennett and Clarke Avenue near Route 440 which will include six units of affordable housing. 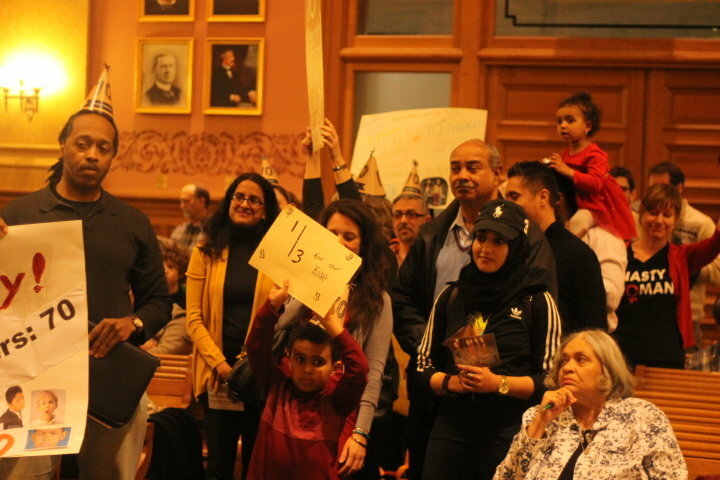 Although unable to prevent the council from acting, the protestors raised an issue that will likely become more contentious if and when the state cuts back on aid to the school district. Under state regulations, cities are allowed to offer potential developers PILOTS, payments in lieu of taxes, reducing the taxes on proposed projects, intended to serve as an incentive for development in a city. In the past, the law exempted developers from paying county and school taxes. A law suit filed by Secaucus and other municipalities in the early 2000s forced the state to modify the law to allow five percent of payments made in lieu of taxes to go to the county. But current law still prevents developers from paying school taxes. The protestors said the mayor and his allies on the council have not lived up to campaign promises made in 2013 to stop abatement. Simon said the policies never did. 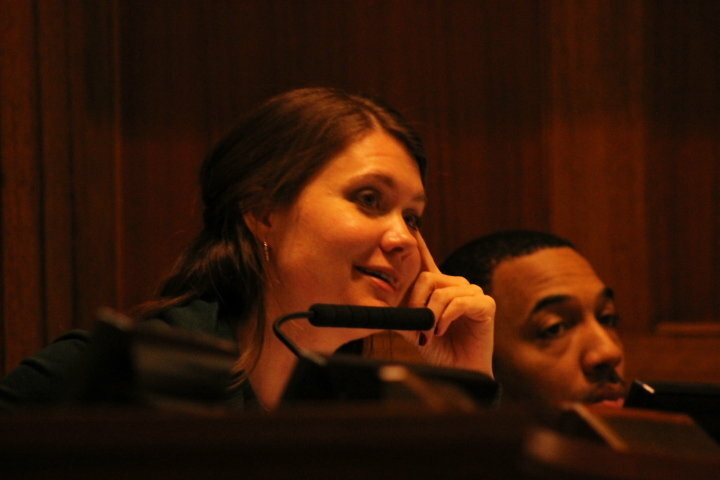 Council member Candice Osborne has defended the policy of excluding schools, saying there was no negative impact on local taxpayers because the city gets more from each abatement than it would under conventional taxes, while the cost of schools is offset by the significant amount of state aid the city receives. Simon, a leading voice against this exclusion while still on the board, said the state is rethinking its aid to the schools. Because the abatements issued by the city can last for 20 to 30 years, the burden will fall on the backs of other taxpayers. She said it is a misconception to believe that if the state gave Jersey City all the money it’s required to that would make up for the abatements. “This is also incorrect,” Simon said. “Even if the state met every cent of its funding obligations under the 2008 School Funding Reform Act, the schools would still be underfunded by $90 million a year, because Jersey City isn’t meeting its obligations to its own children, thanks to the tax abatements. She said if the city were to fund its own schools, this would not have a negative impact on state aid. “We now underfund our schools by $90 million a year, while we are the recipients of $416 million in state aid. 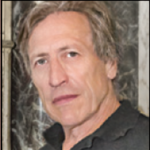 Put simply, this makes us look bad,” Simon said. “This makes us vulnerable to critics who see our skyline grow and our unemployment decline, even as we hand out new tax breaks to developers that include nothing for our schools. She said the aggregate consequence of the city’s abatements, some of which were awarded before the current council members were seated, is that Jersey City contributes roughly one ¬third the funding it should to its schools under the state’s funding formula, according to data from the Education Law Center. Council President Rolando Lavarro, however, said the city council does not have the ability to amend the pilot laws on a local level. Osborne said state legislators who may be proposing cuts are those who also control the abatement law, and if they want to change it, they should. State Senate President Steven Sweeney is currently in discussions to do that. Assemblyman Nicholas Chiaravalloti has already submitted legislation to change the abatement law to require payments to school districts. Simon asked the council to vote down this and future abatements if they are unable to change the law. But protestors said Jersey City should to follow the lead in Bayonne, where a portion of the abatement will be given to the school district. The city has the ability to award a portion of PILOT payments to the district if the council wants to. Osborne, however, defended the city’s abatement policies under Fulop saying they were designed to bring economic prosperity to portions of the city beyond downtown and the waterfront. She said 52 percent of the 70 abatements were short, five-year abatements that the state encourages in order to upgrade older residential areas, nine percent were ten year abatements, and 69 percent of all the abatements were for property outside downtown and the waterfront. Of the 31 percent downtown and along the waterfront, three long term abatements went for hotels, three for significant office space, and three for buy ups – a program offering increased years of abatement for significant give public givebacks. “We have since discontinued buy ups,” she said. One project recently approved will give Jersey City a new public school. Councilman Michael Yun, who along with Richard Boggiano voted against the project, said the city had reduced the annual service charges on abatements from 15 to 11 percent under Fulop, and suggested restoring the 15 percent fees and giving the school district the 4 percent difference. Councilman Chris Gadsden, who reluctantly voted for the abatement, said as a vice principal to a Jersey City public school he fully understood the impact of cuts in state aid. But he said he was additionally concerned with the lack of compliance by abated projects that were required to hire local people as a condition for an abatement and apparently are not living up to the commitment. “We need to do a better job making them comply,” he said.